LEGOLAND Discovery Center Atlanta is seeking a new team of Junior Construction Panel members for 2014. Joshua Bohn, the LEGOLAND Discovery Center Atlanta’s master model builder, is looking for fellow creative minds to join his specialized team. Junior Construction Panel members will access to special events, provide insight on future events at the attraction and be part of a group of opinion-leaders who will lead LEGOLAND Discovery Center Atlanta into the future. The master model builder and the LEGOLAND Discovery Center Atlanta team are looking for two groups of kids, one group of 5-to-8 year olds and another group of 9-to-13 year olds, to serve on its Junior Construction Panel. With the help of a parent or guardian, LEGO builders between the ages of 5 and 13 can apply by submitting a photo of their original creation via the specifications below. Parts from LEGO sets are allowed, but the float cannot be an assembled set. The float should have a body that is no larger than 8 studs wide by 20 studs long by 8 bricks high (no base is needed by the entrants—selected entries will be provided with a base). Entrants must submit a photo of their work to claire.barron@merlinentertainments.biz from April 21-May 4, 2014. Submitted work should include the child’s name and age, a photo of the float, as well as an email and phone number for a parent or guardian. Entrants’ photos will be uploaded into an official Junior Construction Panel 2014 Facebook album on May 5, 2014. From May 5-11, Facebook fans may vote for a submission by liking the original photo in the album. One like is equivalent to one vote. The 12 pictures with the most likes will be the new Junior Construction Panel members. Winners will be announced on May 12, 2014 and their respective floats will be displayed in MINILAND throughout the month of June. What do Kids Receive for Entering or Being Named a Junior Construction Panelist? 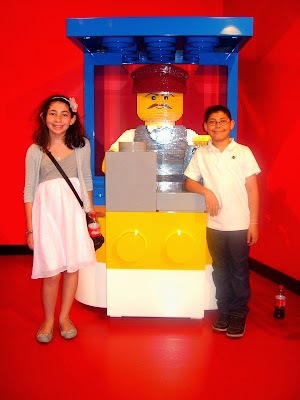 The children selected to serve on the Junior Construction Panel will receive the royal LEGOLAND Discovery Center Atlanta treatment and a seat as a member of the panel for one year, a special “box of imagination,” as well as an Annual Pass for the center, granting them free visits for an entire year.